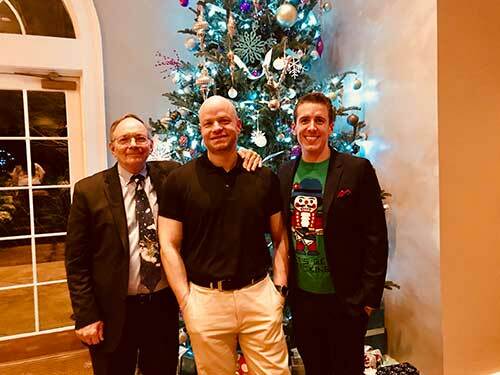 Members of Network Depot’s leadership team recently attended an annual holiday party graciously hosted by their partner Converged Network Services Group-CNSG. This festive event took place at the Bethesda Country Club and featured presentations by CNSG, networking and socializing with a wide variety of CNSG’s partners, agents, customers, and suppliers, and plenty of holiday cheer. CNSG prides itself on being the leading solutions provider for comprehensive, end-to-end telecommunications services for businesses and enterprises of all sizes. They are a master agency for connectivity, cloud, and cloud enablement and have won many awards recognizing their services. CNSG’s highly-skilled team provides carrier, cloud and IP infrastructure services, as well as expertise on contract negotiations and issue resolutions for a wide variety of industries and organizations. They have been helping manage all aspects of telecommunications infrastructure since 2007. The Network Depot team enjoyed visiting with CNSG’s Managing Partner Ali Niroo and other CNSG representatives, Tom Uss (featured in the photo with Network Depot’s Paul Barnett and Chris Boyd) from Communication Systems INC., and many other interesting attendees from companies based throughout the DMV. The team didn’t take home any awards from the party’s “Best Dressed” contest, but they did make a contribution to the ugly sweater competition. Network Depot looks forward to a continued productive relationship with CNSG in 2018 and to next year’s holiday party.